In the last tutorial we got Demul up and running, but in order to do anything useful with it we’ll need to configure some of its features. The graphics settings are the most complicated, so we’re dedicating all of this tutorial to them. Lets dive right in and configure the graphics settings. Open the “Config” menu and choose “Video”. The window shown below will then appear. There are a lot of potentially complicated things to configure here, so take a deep breath and maybe brew yourself a coffee while we go through them all. Windows resolution – Resolution is the number of pixels in each dimension that can be displayed. The more pixels you have, the sharper and better defined the image will be. The Dreamcast had a resolution of 640×480, but of course modern PCs can go well above this. The higher you set this setting, the better things will look, but higher settings put more demand on your computers processor. If you choose a widescreen resolution (such as 1080p – 1920×1080), be sure to read the section on aspect ratio and image stretching too. Note – If the emulator seems to ignore this setting, you will need to change your Windows desktop resolution instead. Demul should then copy whatever resolution you have Windows set to. Aspect Ratio – See “Aspect Ratio and Image Stretching” later in the article. Vsync – Vsync is short for vertical synchronisation. It’s a technique that helps prevent graphics tearing or stuttering by synchronising the output frames to the refresh rate of your monitor. Generally this is a good thing, but it has one significant drawback. If your PC can’t draw frames quite quickly enough, the frame rate of the emulator will drop significantly. In that case, you might decide it’s better to put up with the occasional torn frame than suffer the sudden, jarring reduction in game performance as the emulators speed is typically halved. Users with fast PCs can usually leave this setting enabled, those with more modest machines may need to experiment and see what works best. Use Fullscreen – Usually you will want to play your Dreamcast games in full screen, without the distractions of the desktop around the window. While setting up the emulator you might want to leave this setting off, until you have everything perfect, but normally most users would want to enable this option. Internal resolution – Explaining this one is a little tricky. Basically, internal resolution is the resolution the game is rendered at, this is different to the the full screen (Windows resolution) resolution which is the resolution the game is scaled to on the monitor. 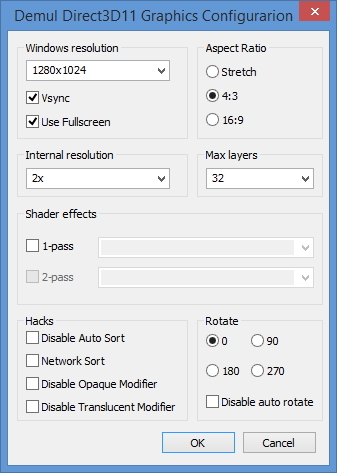 All you need to understand is that increasing this setting can significantly increase the visual quality of the games, but it also significantly increases the load on your computers CPU too. Typically this setting has diminishing returns, 2x is a lot nicer than 1x, but 3x and 4x don’t give such dramatic improvements. Again a little experimentation might be required to find the most optimal setting. Users with fast PCs should start with 2x, while those of you with more modest machines should definitely start at 1x. On our test machine we couldn’t go higher than 2x with the DirectX 11 plugin without the emulator crashing on startup. Max layers – Available on the Direct3D 11 configuration window only. We’re not actually certain what this setting does, but we know it affects emulation accuracy. On most computers, setting it to 8 will produce good enough results. Setting it to 16 or 32 requires a powerful graphics card. Our test machine runs an Nvidia GTX 770 graphics card and has this setting at 32. Shader effects – These are optional effects that change the appearance of the image. Some, like “CARTOON” are just for fun, while others like “FXAA” (fast approximate anti-aliasing) can improve the image quality. With 2D games, the Scanlines filter can give the games a nice retro look. Again, using shader effects puts more strain on the computer. Users with faster PCs might want to try FXAA for a slight improvement in image quality. Hacks – These options improve the speed of the emulation at the cost of accuracy. The most important one is “Disable Auto Sort”. Users on more modest hardware should select this option to improve performance in games. This does reduce the accuracy of the emulation however, and you may find that lighting or other effects aren’t drawn as accurately when this setting is enabled. Rotate – Rotates the screen display. Not really needed in Dreamcast games, this is included since Demul also emulates Naomi, Sega’s highly successful arcade and coin-op hardware platform that runs on similar hardware to the Dreamcast. The aspect ratio settings in Demul (and fellow Dreamcast emulator Makaron) are confusing and seem to behave differently depending on if you are using the DirectX 10 or DirectX 11 plugins. Theoretically, using the 4:3 aspect ratio option will shrink the image to fit properly in a 16:9 screen mode. To put it another way, 4:3 should have the borders at the side of the screen, while 16:9 and Stretch should stretch the graphics out of proportion (16:9 will only stretch the image to standard widescreen, while stretch will stretch it even further if your display is capable of this). Some people actually prefer to play this way, though we’re not sure why. What actually seems to happen though, is that the image is excessively squashed using the 4:3 aspect ratio mode. In the photos below we’ll show you exactly what happens. In the above picture, Demul is set to stretch mode, as you would expect the image is stretched across the entire display, despite it being too wide. The Dreamcast ran in 4:3 aspect ratio and most people find this stretching rather ugly, but of course it’s up to you. In the above picture, Demul is running in 4:3 mode. Something is clearly not right there, the image is far too squashed. This only happens when using the DirectX 10 video plugin. Here the emulator has been started in 16:9 mode, but the display has been put into 4:3 aspect ratio. Not all displays will allow you to change a 1080p images aspect ratio like this however. If you don’t want to play in stretch-O-vision and you can’t use Demul’s DirectX 11 plugin, you should set the emulator to run in a 4:3 aspect ratio screen mode. 1400 x 1050 is great on 1080p displays (if your display supports it), 1280 x 1024 works well too (although that’s technically a 5:4 mode). While it’s a little less convenient, we found that setting a 4:3 aspect ratio screenmode in Windows and Demul, rather than letting the display correct the aspect ratio, gave the best results. Phew, we’re now done with the video plugin configuration. Click on “OK”. There’s one more thing to explain before we’re done with video configuration entirely. Open the Config menu again and go down to “Video mode”. You will notice the options “VGA”, “TV ( RGB )” and “TV (VBS/S, RF)”. If you’re not familiar with the Dreamcast you might wonder what these options are. Basically, the Dreamcast console had a wide range of connectivity options. You could use a VGA box and plug the console into a computer monitor, you could use a RGB cable and a SCART TV (common in Europe), or if you weren’t so lucky, a composite video cable or an RF cable. 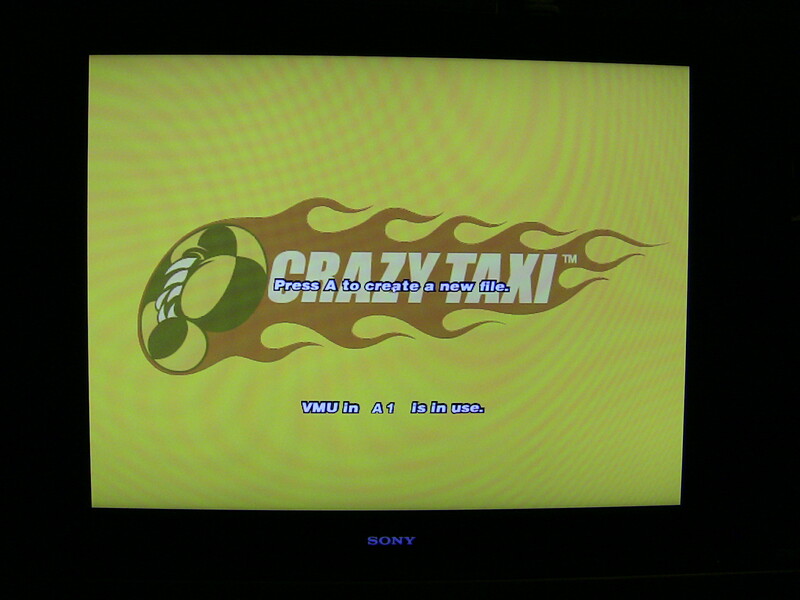 If you are using a real Dreamcast, you shoot for the VGA or RGB connections every time, since they give the best picture. On the emulator however, it doesn’t really make that big a difference since everything is output through your PC. TV (VBS/S, RF) has the best compatibility with games, so generally you just leave it on that setting. That concludes this part of the tutorial. In the last part, we’ll set up the remaining plugins and finally start playing some games. What graphics card does your PC have? Figured it out from a post over at the Shenmue Dojo. Apparently, upscaling and shaders aren’t yet supported in this build when using DX11. DX10 should work. I’ll probably try it out tomorrow when I’m not so tired. Thanks anyway, Bucko. There’s no DirectX10 support in 0.7a at all, but choosing “gpuDX11” rather than “gpuDX11ng” should solve your issue. It appears we’re both wrong. The options are “gpuDX11” and “gpuDX11old.” You have to select the latter if you want upscaling. They must have changed that in the latest build. Yeah, also noticed that under hacks, “disable auto sort” is checked by default. This causes weird sprite overlapping issues when you have upscaling set to 2x and above.